One’s a local business, owner, another’s a teacher, and the third practices environmental law. But they never grew up! These three rope jumping enthusiasts include Tarilyn Greenfield, Mere Crafton and coach and choreographer, René Bibaud. Combined they hold over 6 World Championships, set a world speed skipping record, & performed in 2 tours with Cirque Du Soleil as a performer and coach. Coach René Bibaud has appeared on the Tonight Show with Jay Leno, Rosie O’Donnell, MTV, Good Morning America and all three have been shown competing on ESPN! Ropeworks has a special focus on youth motivation and fitness and excels at sharing the benefits of the single best fitness tool available. 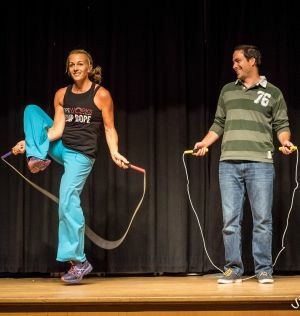 Ropeworks combines acrobatics, dance and jump rope in an energizing performance. Wear your tennis shoes – because you’re gonna learn to jump too!